Gallery DUO starts in on this months’ First Friday a little early. Their reception for Visions of Summer, on Thursday from 7-9pm, will feature new work by gallery owners/artists Alessandra Manzotti and Sus Iserbyt. Alessandra showed me around the gallery, which is in the old forge building in Fairville. The exposed beams and leaning brick chimney which cuts through the back end of the gallery make for a dynamic and unique space. She held up photographs from her trip last year to Mongolia, as well as new close up photographs of a frozen lake. The cracks stretch out across the composition creating a beautiful, spindly design. Although I didn’t have the opportunity to meet her co-gallerist, painter Sus Iserbyt, I did see her work space set up against the front window looking out onto Rt 52. Stop by to check out their new work and see the space for yourself. West Chester’s Art Trust will host a reception for their upcoming exhibition of Mitch Lyons’ work, on October 5th from 5 – 8:30pm. Lyon works in a few different traditionally three dimensional media by creating clay monoprints as well as more traditional ceramic vessels. Stop by and check out his work. Through November 9th. 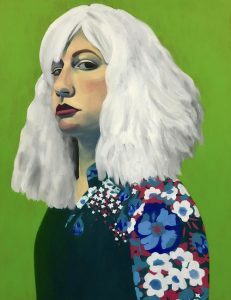 Somerville Manning is currently hosting a solo show by painter, Timothy Barr. Barr’s paintings of local landscapes, flora and fauna exhibit a warm luminescence reminiscent of Maxfield Parrish. His pieces which are at once calming and majestic, showcase the natural beauty of the Brandywine Valley. See this exhibition before it ends on October 13th. As always, check out the Wilmington Art Loop for a fun First Friday Art Walk from 5 – 9pm. This month at Delaware Contemporary, check out “On Being Human,” a new exhibition featuring artists Lauren E. Peters and Ken Mabrey. The show focuses on the figurative. Both arists create highly stylized interpretations of portraiture. Peters focuses on very bright, almost flat self portraits which combine patterns and blocks of opaque color. Mabrey creates more fluid, serpentine figures. He employs a more extensive palette to accentuate the liveliness of his mark making. This exhibition will be on display through October 28. 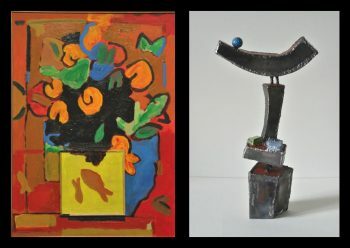 Blue Streak Gallery will be hosting reception at 5pm on Friday for their new show featuring sculpture by Karen Delaney and paintings by Gus Semas. Karen will show her sculpture and paintings from her Pagoda Series and Gus will feature new paintings from his Persephone Series. Stop by and enjoy a glass of wine. This exhibition will be on display through October 31. Stop by Station Gallery on your way into Art Loop for the reception of Michele Green’s solo exhibition, “Up The Creek,”. 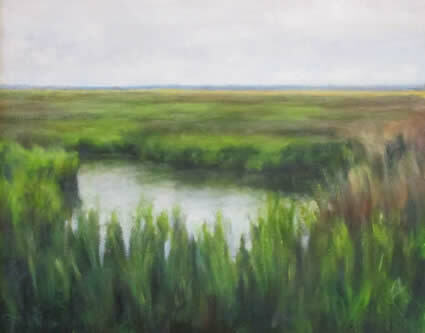 A plein air painter whose inspiration is the Delmarva Peninsula, Green says of her work, “I like to paint what people forget to look at.” Her paintings are soft and gentle, the horizon line quietly folds over itself in her pieces, and her compositions are lush with a natural palette. Enjoy this exhibition through October 27. Back in Kennett Square, enjoy Square Pear’s upcoming October exhibition, “Layers,” featuring work by Woody Patterson, Peter Saenger, Robert Jenkins, John Baker and Corein Siepelinga. The multimedia show will be on display through the end of the month. Tune into Art Watch on WCHE 1520AM every Wednesday from 1-1:30pm. Next Wednesday October 3rd, Lele Galer, painter and sculptor, interviews – Jan Michener, of AHHA, Coatesville, and Dr. Ellie Brown of National Endowment for the Arts. Until next time!